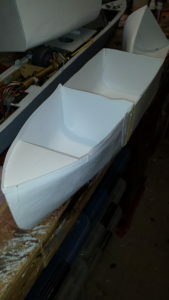 With the club vac-u-former, we have been producing several ship superstructure items. These include turrets, bridge structures and gun shields to name a few. 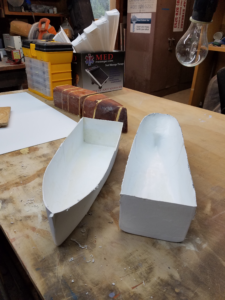 We have also been producing several Motor Torpedo hulls such as the German Schnellboot, the American Elco PT and the British Fairmile D.
One of our biggest projects has been to begin producing inexpensive and easy to construct convoy ships. We now have two versions and working on a third. 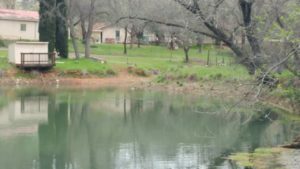 In addition, some are being made sinkable and other non-sinkable. For our first convoy ship, Jim Webb built a solid block hull plug of a generic cargo ship (shown to the left). 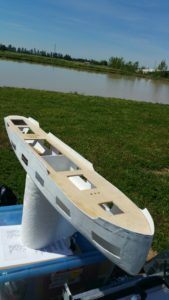 Because of the overall length of the ship, the hull needed to be done is four parts; bow, stern and the center section twice. 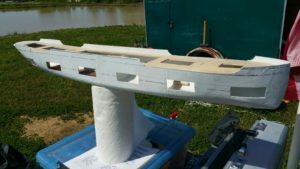 In this photo, the front two sections have been connected together, with the stern and remaining center section to be done next. Three down and just one to go. This generic hull was used by one company, which produced several different types or styles of ship. 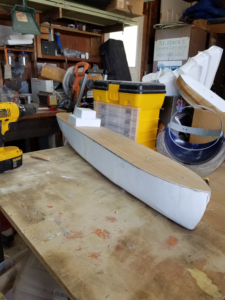 Depending on what was ordered, the hull could be made to fit any length necessary. Bow and stern areas could be raised or lowered, again depending on what type ship was being ordered. In the case of the AMS Centaur, the bow, stern and portion of the center section were raised. This ship configuration was unique as the had a much larger 3 deck superstructure in the center. 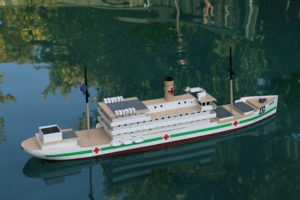 The Centaur was an Australian Hospital ship that was used during the war. 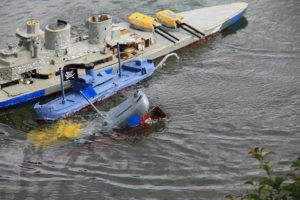 Next we have photos of the second version of convoy ships we are starting to produce. Slightly shorter than the version above and only done in two sections. 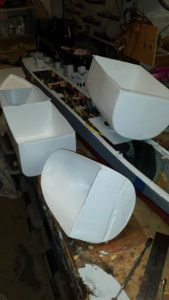 However; for separate compart mentation purposes, the cargo ship can be done in 4 sections (see some of the solid blocks used to create the hull behind the two styrene hull pieces in the foreground). 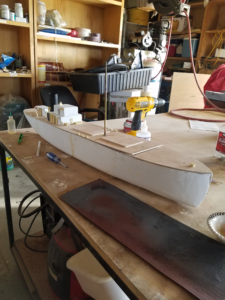 Here the prototype merchant ship is beginning to take shape. Much more detail has been added and you can clearly see that the first one is being done with 4 separate compartments. The second variation of the same merchant ship is shown below. 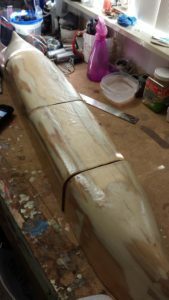 You can see that this one is being built in two halves and is this is beginning to have the penetrable areas of the hull cut out. To hopefully increase the survivability of our growing cargo fleet, the “windows” being cut into the hull are smaller than what is typically found in the standard combat ship. Also, these areas will not have any balsa wood covering them. They will only be covered in silkspan tissue paper. 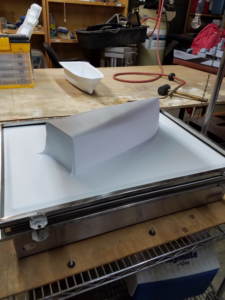 The reason for using the tissue paper is that after painting it is strong enough to keep water out (until we shoot holes through it) and still allows for a scale appearing ship. Since we continue to want our sips to look as scale and realistic as possible, we never considered the “duct tape” method used by other combat clubs. 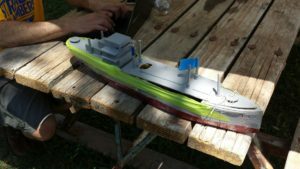 Below are photos of typical convoy ships built and operated by another small scale combat club utilizing non-scale appearing paint schemes and colored duct tapes. Fortunately this form of construction IS NOT ALLOWED in PMWC.